Arizona Naturalist >>> Sycamore Gallery Arthropods >>> Diptera >>> Physoconops sp. Observed at Sycamore Canyon on the west side of the Mazatzal Mountains, Maricopa Co., Arizona, USA. 16 May 2010. The immature stage is a parasite, possibly of a bee. A naturalist who takes the effort to observe and learn about these colorful insects that can be found visiting flowers for nectar, should come away with a sense of awe. 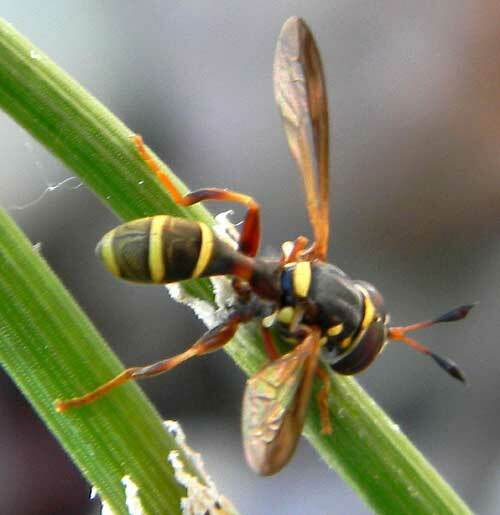 To find that an insect has a wasp-disguise so precise. A precision designed by evolution over tens of millions of years as sharp-visioned insectivores ate the would-be ancestors with less-than-convincing habits and colors. Now the best wasp look-alikes can quietly sip nectar as birds and lizards choose not to get stung - even though this fly cannot sting at all. The behaviors of all conopids are among the most unusual in the insect world. Cirrus Images - Amazing Shots!